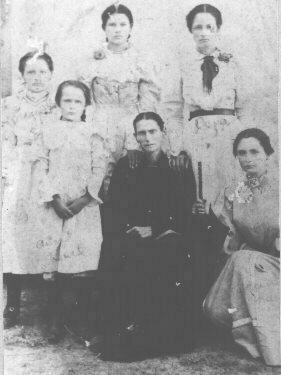 Pictured Nancy E. Franks Hager, widow of James Hager, and her 5 living daughters. This picture was taken ca 1900-1901 shortly after Nancy's arrival in Caldwell, Texas from Conway County, Arkansas. She moved to Texas to live near her Franks relatives after the death of her husband. B: About 1793 in Rutherford Co, NC or 10 Apr 1785 ? m. Panina b ca 1805 in N.C.
1. Elisha D. m. Fairby? 7. Eli A. b. ca 1833 (tombstone says 1830) d. Aug 10, 1884, m.